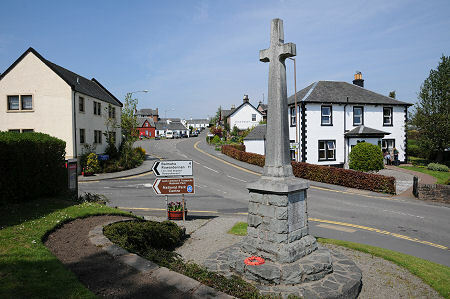 Drymen owes its origins to the fact that just to its south was the lowest point at which the Endrick Water could be bridged as it flowed into Loch Lomond, a couple of miles to the west. The remains of a medieval motte built to guard the crossing can still be seen near the modern bridge carrying the A811 across the river. In the 1700s Drymen found itself on the route of the military road from Stirling to Dumbarton. 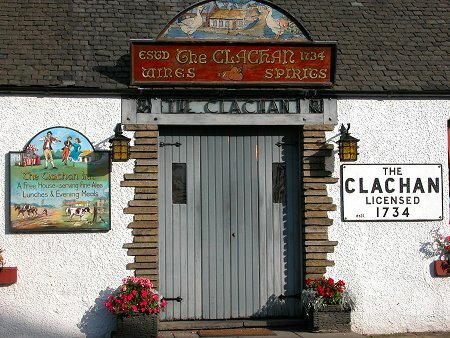 The Clachan Inn, on a corner of The Square, dates back to this period and carries signs proclaiming that it was first licensed in 1734. The Endrick Water was bridged in stone in 1765. Another sign of Drymen's increasing importance was the opening here of a post office in 1798. Once Sir Walter Scott had made The Trossachs the place to see in Scotland, Drymen was ideally placed to take advantage of the tourist boom that followed, lying on the road from Glasgow to Aberfoyle, and at the junction with the road travelling to Balmaha and the east side of Loch Lomond. Drymen never quite made it into the railway era, with the nearest station opening at Croftamie, a mile and a half to the south and beyond the Endrick Water, in 1856. Rather more significant was the opening of a steamer pier on Loch Lomond at Balmaha. The railway connection, such as it was, ended when passenger trains ceased to operate on the line through Croftamie in 1934. The leisure boom of the second half of the 1900s and the establishment of the Loch Lomond & The Trossachs National Park have cemented Drymen's popularity, to the point where it can be both very busy and difficult to park at times. The main parking area is just to the east of The Square, off Stirling Road. In an effort to ease congestion in the village, the A811 Stirling to Dumbarton road now bypasses Drymen to its south east. This means that anyone wanting to visit the village, or the eastern shore of Loch Lomond, has to make a conscious decision to turn off the main road at one of the junctions to the south or east of Drymen. One group of travellers have no parking problems. The West Highland Way Long Distance Path passes just to the east of the village and many on the route make the short detour into Drymen to take advantage of the wide range of facilities here. These include the already mentioned Clachan Inn, while the Winnock Hotel has been converted from a row of cottages on the west side of the square. A little to the south is the rather larger Buchanan Arms Hotel. You will also find shops and a post office here, together with a village hall and a community police station. South of the village, not far from the southern junction with the A811, is Drymen Parish Church. This was built in 1771 and spent much of its life in the red sandstone coat its builders intended. It was painted white in 1961 and today it is difficult to image it looking as it had until then.